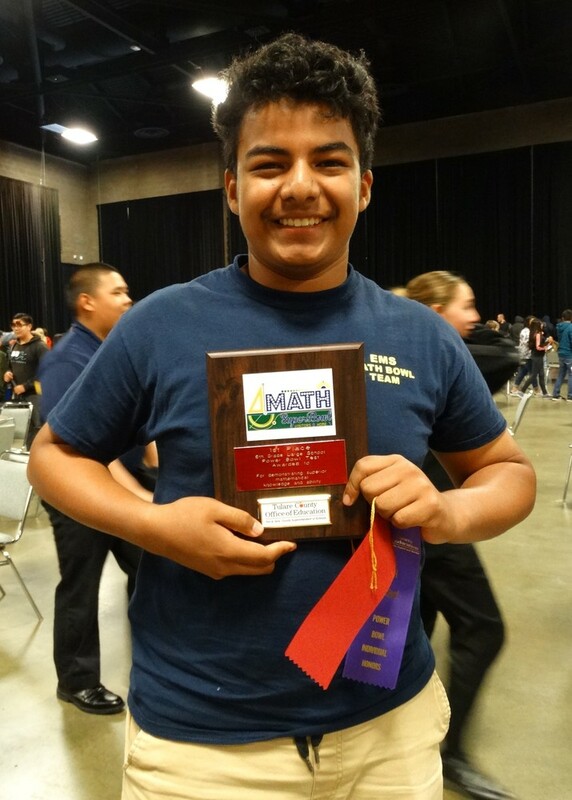 Math Bowl hosted by Tulare County Office of Education took place April 9th at the Visalia convention center. As the Earlimart students walked into the competition room, their faces lit up in astonishment. One 7th grade student commented, “I have never seen so many students in one place.” The room had over 125 tables set up with eight students per table. After getting our students situated with their name tags, we had a brief meeting encouraging the students to do their best. Once the competition started, the students were on their own. The first part of the competition consisted of the individual assessment known as Power Bowl. These assessments were scored by scantron. The second part of the competition consisted of mixed school collaboration or Pro Bowl. The students were placed with other students from schools also located in Tulare county and asked to work together to complete a performance task. This required our students to collaborate, reason, and explain their thought process while working with complete strangers. The last part of the competition was Team Bowl - each school set up teams of 4 or 5 competing for the best score. During this part of the competition, students divided up the assessment questions and completed them within a certain amount of time. The team was scored as a whole. We are proud to announce that many of our students were recognized for their excellent and superior work throughout the competition. The following students received ribbons of acknowledgement: Edwin Gomez, Julia Carranza, Mia Ochoa, Clement Flores, Jennifer Ambriz, and America Huerta. The highest award was given at the end of the competition- The Math Super Bowl Champion. This award is only given to one seventh grade student and one eighth grade student in Tulare County. It is our honor to have one of our very own students- Edwin Gomez receive this prestigious award in plaque form.